Tinipak River is located at Mt. Daraitan in Tanay, Rizal, around 2-3 hours drive from Manila. As I have written about in my previous destinations, Tanay is becoming one of my favorite places to visit for day trips outside of Manila. 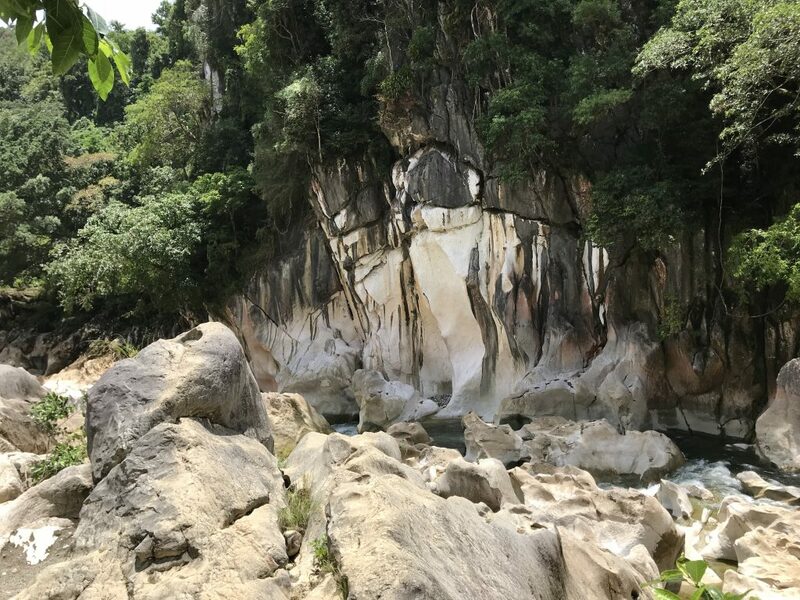 There is so much diversity with beautiful waterfalls like Batlag Falls, caves such as Calinawan Cave, unusual rock formations such as Nagpatong Rock and of course beautiful rivers such as Tinipak River, the subject of this post. 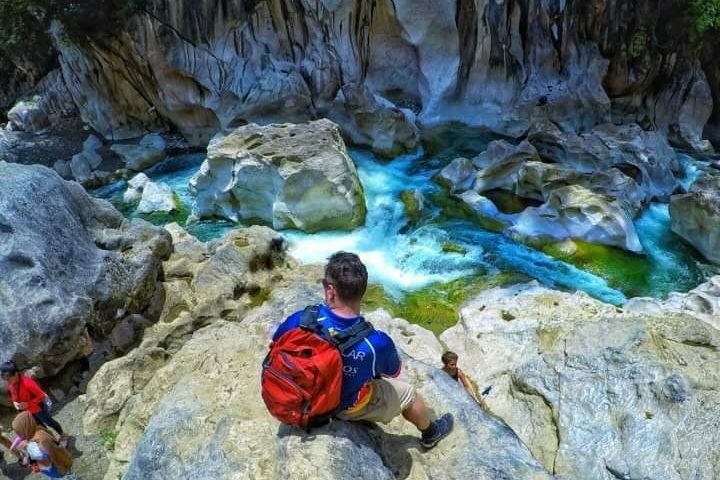 To get to Tinipak River is quite an adventure. After about a 2-3 hour drive from Manila, you end up in Barangay Daraitan and the Barangay Hall. There is ample signage on the main highway and the locals are quite helpful in helping you find the Barangay Hall. Once at the Barangay Hall, you need to register and you are then assigned a guide. From there you are provided with some essentials that are needed such as a headlamp for when you go caving. You are also able to buy other accessories such as gloves, which I do recommend due to the rough nature of the rocks. After a brief orientation at the Barangay Hall and registration area, you take a tricycle to Tinipak River which takes about 20 minutes. From there this is where the hike begins. The hike itself isn’t very intense with a well-worn trail with some areas partially paved. Generally, the terrain is flat however, there are a few sections in which there are boulders disrupting the trail. However, there are bamboo steps that allow you to pass through. The rock formations along the river are absolutely unbelievable and unlike anything, I have seen before. Rather than the typically rigid rock formations in this area, a lot of these rocks have a much smoother appearance. However, they are just as spectacular. The colour of the water in the river is also very unique. It has an emerald/ turquoise appearance to it and looks like artificial colours have been added to it. 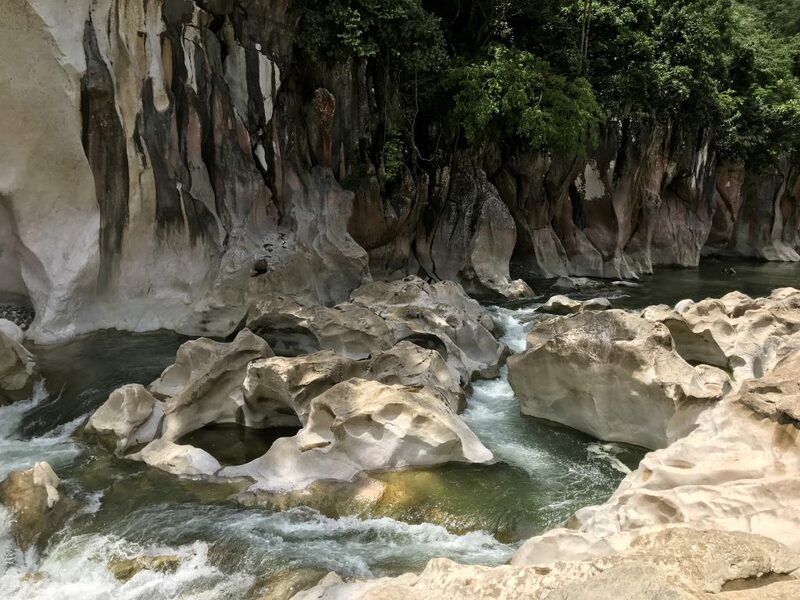 With the various colours of the water, coupled with the amazing rock formations along the way this is some of the most sensational natural scenery I have experienced in the Philippines. After approximately 90 minutes you reach the river crossing that takes you to the underground cave. 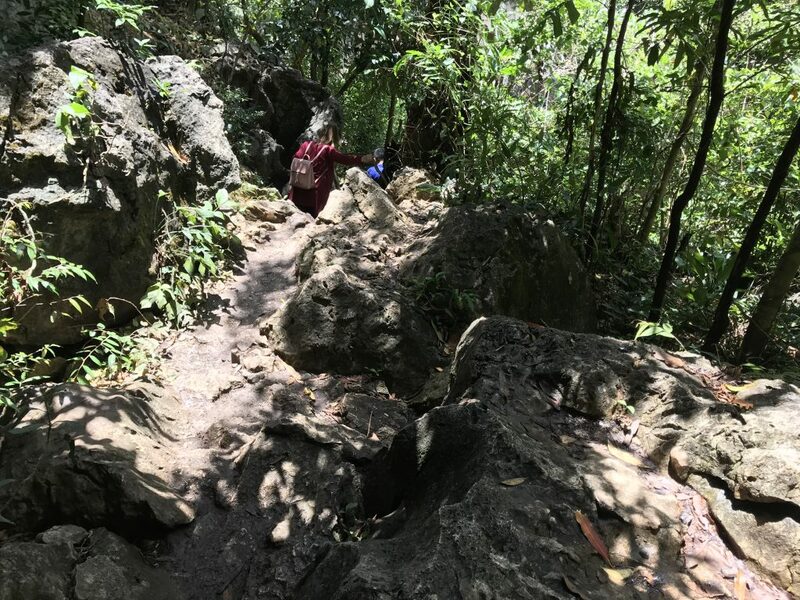 This is a bamboo bridge that takes you across to a bunch of limestone boulders that you need to carefully negotiate in order to reach the entrance of the cave. This isn’t too difficult but you need to be careful as the rocks are quite slippery. From there, you reach the entrance and once again take a bamboo ladder down into the cave. This is only a couple of meters deep and is where your headlamps are essential. Then after about 10 minutes of negotiating your way along the rocks, you get to a small basin in which water is flowing through. There is a small waterfall that leads to some rapids that pass through the basin. This is one of the most unique wonders I have seen in the Philippines. It is basically an underground waterfall with beautiful fresh water which is very enjoyable after negotiating your way through the hot cave. After enjoying some time cooling down in the beautiful fresh water, it is time to exit from the cave. 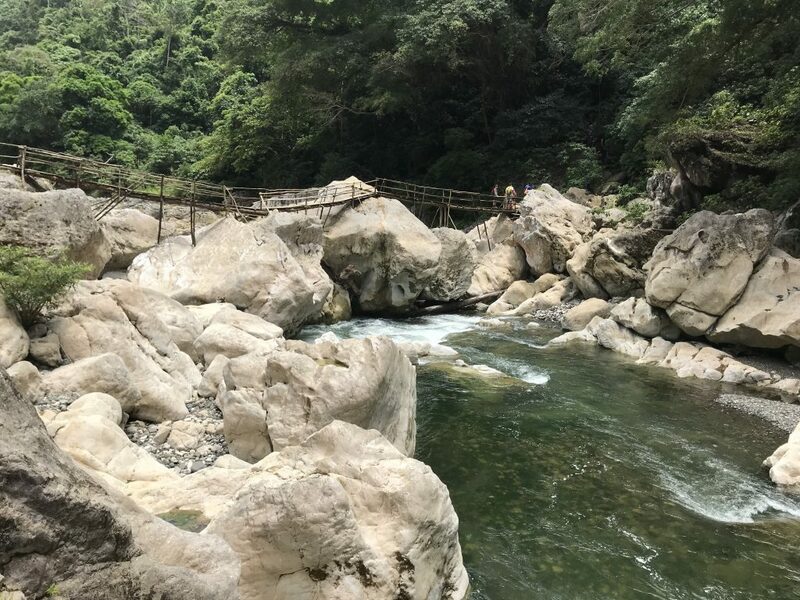 After negotiating your way back up the bamboo ladder, and across the limestone boulders, you cross back over the bamboo bridge. 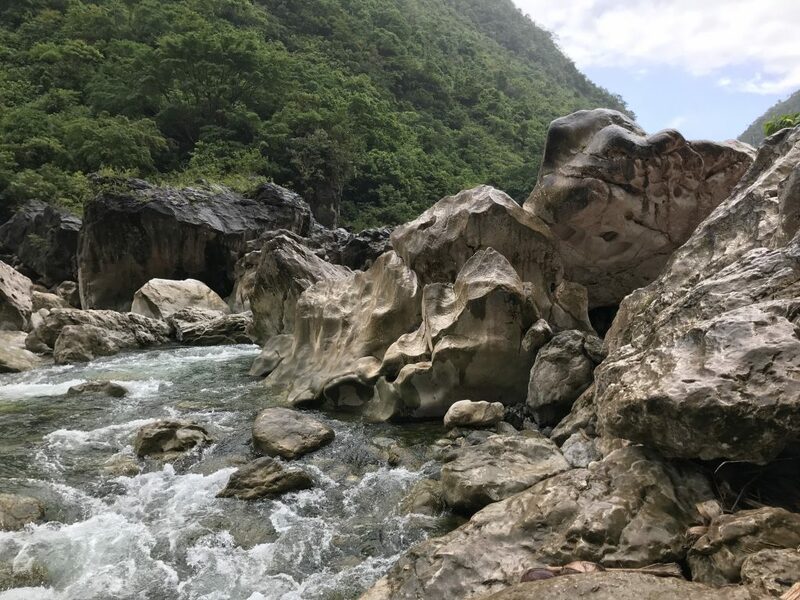 From here you get the opportunity to have a splash around and relax in the river amongst the giant limestone boulders and cliffs. Luckily for us, our guide was able to carry our ice box which contained our lunch and some drinks. Sitting among the rapids enjoying our lunch with a few drinks was the highlight of the day. This topped off what was a truly incredible experience. After relaxing and eating lunch, we hiked back to the tricycle drop off area and then back to the Barangay Hall for our trip back to Manila. To learn more, you can watch my vlog about this epic day trip. Due to time constraints, we were not able to tackle Mt. Daraitan which was a little disappointing, however, this gives me an excuse to go back and visit this place again. Having seen some photos of the rock formations of Mt. Daraitan, I am eager to go and visit this place again. Some of the amazing rock formations that you will see along the hiking trail. 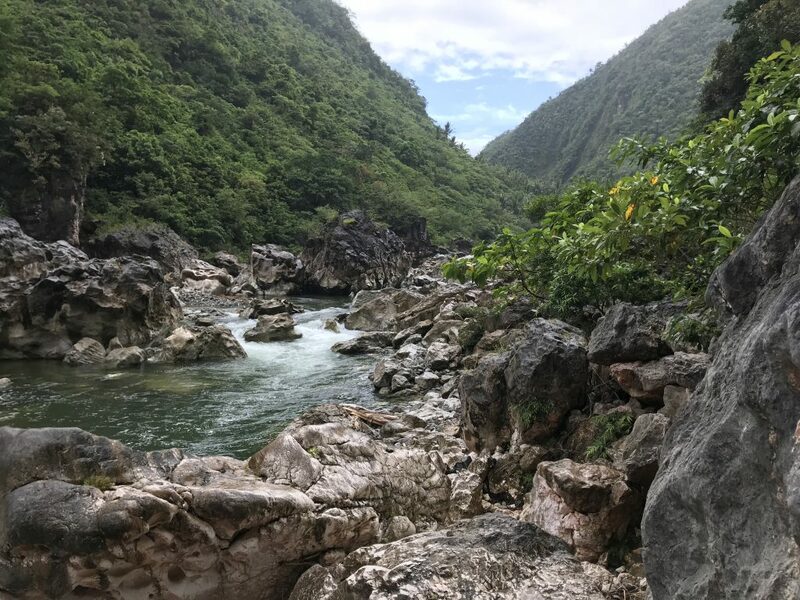 This really is one of the most unique rivers I have seen in the Philippines. The color of the water is amazing but the camera doesn’t quite do it justice. This is the bamboo bridge that takes you across the river to the underground cave. These rock formations are very smooth compared to the usual jagged limestone rocks you see in this area. The cliff wall looks like it has been chiselled by hand. This is a truly amazing formation. This shows the actual hiking trail. The condition of the trail is quite good, but it can get very slippery in parts so you need to have your wits about you. Please click below to check out my vlog from this epic day trip! Tinipak River is fairly easy to locate using Waze or Google Maps. Just search for Daraitan Barangay Hall. You just need to look up Mt. Daraitan and you will find road signs as you get closer. Mt. Daraitan is approximately 100 kms from Manila and takes around 2-3 hours to get to. Take a jeep from EDSA-Shaw to Tanay, Rizal and get off at Tanay Public market. This takes about 2 hours and costs P100. Then go to the jeepney terminal and take a jeep to Sampaloc, Tanay (30 mins). From there take a tricycle or hire a habal-habal (motorbike) to Brgy. Daraitan. This takes 30-45 mins and costs about P100. From there you take a tricycle to the starting point for the hike. This costs P60 for up to 4 people. It is advisable to wear good hiking boots/shoes due to some of the boulders that you will encounter along the way. The trail along the way was generally quite slippery, so you need good grip on your footwear and need to really exercise caution along the way. I would also recommend the wearing of gloves to protect your hands.